The first half of the nineteenth century saw the preliminary closure of a debate on the nature of light that had been going on more or less since the times of Newton. •	Corpuscular theory, which stated that light is supposed to consist of small particles. This was heavily backed up especially by Newton, based on the observations (for example) that light seems to somewhat move in a straight line (that’s how shadows are “made”) and that light reflects off a mirror much the same way an object bounces of a wall. •	And the wave theory, which stated that light is supposed to be more of a wave. This was mainly introduced by Huygens, who likened the light to be like the waves on a water surface if you throw a stone into the water. The nineteenth century saw the intermediate triumph of wave theory due to a number of experiments, the first being the famous “double slit” experiment of Thomas Young. Imagine two different water waves, from two different sources, passing through each other. In the first order, these two waves will pass each other unhindered. In the second order, where a wave top will meet a wave valley, in the average you will see no wave at all. On the other hand, where two wave tops meet, you would still get a significantly higher wave. Young repeated that with light passing through two holes in a wall (to generate two different waves), and found out that the same thing happens – behind the wall, there is an interference pattern of dark and bright spots. Other (mostly more theoretically oriented) philosophers such as Poisson or Laplace profoundly disagreed and stuck to the corpuscular theory – the debate was on. That’s about the point where Arago joined the discussion. Being a newly elected member of the polytechnical faculty of the university (having, in his earlier years, been profoundly supported by also the major supporters of corpuscular theory such as Poisson or Laplace, who were working in Paris as well! ), in 1811 he chipped in a few observations of himself. Based on the studies of Malus, who had discovered that the light of the sky appears differently when viewed through a calcite crystal, depending on the rotational angle the crystal is held at, Arago plunged into the research of this new property of light. Scientists before him had not only observed this unusual property of the skylight, but they had also realized that a conventional light source could produce the same effects by using not one but two crystals – rotating them relatively to one another. This pointed to the fact, that the first crystal would “induce” a state in the incoming light, that is similar to that of the skylight, while the second crystal would be able to react to this state of light. The angular dependence of it, and the fact that crystals (which are inherently inhomogeneous materials) were all it took prompted the conclusion that this new property was a sort of polarization of the light. In comes Fresnel, who, being a friend and coworker (and actually the more famous of the duo) started to work together with Arago to unravel this new property of light in all its glory. 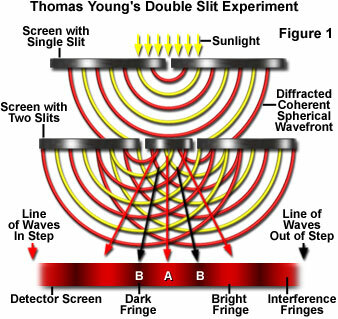 Merging their experiment with the double slit experiment of Thomas Young, they started to systematically investigate the properties of light, the possible interferences and interactions. Fresnel provided the theoretical ground work, while Arago developed the first polarization filter, a polariscope to carry out experiments and realized, that already reflection off a glass surface can induce a certain amount of polarization in the light. At the end of it stood a fairly solid evidence that light was transversely polarized – strong support of the wave theory. The supporters of corpuscular theory didn’t give in so easily. When Fresnel submitted strong support for the wave theory of light in 1818 to a competition of the French academy of sciences, Poisson, who was part of the evaluation committee, tried to cook up a thought experiment that, to his view, would disprove the wave theory altogether. In a modification of Young’s double slit experiment, Poisson postulated, that if the wave theory were correct, one would observe a singular on-axis bright spot if a light beam is obstructed by a circular obstacle (because in the center all light beams coming from around the obstacle have travelled the same distance and theoretically wave top should meet wave tops from everywhere around the circular obstacle). This seemed a very absurd thought to him – and in fact, it is fiendishly difficult to monitor in normal situations, especially without coherent light sources such as lasers, however Arago was able to see and prove the presence of said spot and Fresnel won the competition. Fresnel died of tuberculosis in 1827, but his theories continued well beyond his death. It was a hectic time in optics. Thomas Young and his coworkers in England working on similar issues at the same time. It must have been interesting times. The 19th century saw the almost complete victory of the wave theory over corpuscular theory. A set of experiments and refinements of theory culminated in the Maxwell equations, that seemed, at this period, to be a comprehensive description of the nature of light. But as so often – as soon as knowledge becomes settled, something happens. Einstein was actually the first to suggest that light (but only light) is both wave and partcile, depending how you look at it. He was basically laughed out of the room at the time. In fact, Max Planck, when writing a reference for Einstein when he wanted to join the Prussian Science Academy, famously wrote that he hoped the committee might not count Einstein's crazy theory of how light is both wave and particle against him. However, when Compton published his findings on light scattering on electrons (the so-called Compton effect), there was just no way of explaining this within a wave-model. Louis de Broglie then went the next step and suggested that if light is also a particle, maybe subatomic particles are also waves. He worked out the theoretical basis and Germer and Davisson then conducted diffraction experiments that actually showed electrons behaving like waves.